My friend Wild Bill remained in Deadwood during the summer with the exception of occasional visits to the camps. On the 2nd of August, while sitting at a gambling table in the Bell Union saloon in Deadwood–he was shot in the back of the head by the notorious Jack McCall, a desperado. I was in Deadwood at the time and on hearing of the killing made my way at once to the scene of the shooting and found that my friend had been killed by McCall. I at once started to look for the assassin and found him at Shurdy’s butcher shop, grabbed a meat cleaver and made him throw up his hands. (Through the excitement on hearing of Bill’s death, having left my weapons on the post of my bed.) He was then taken to a log cabin and locked up, well secured as every one thought, but he got away and was afterwards caught at Fagan’s ranch on Horse Creek, on the old Cheyenne road and was then taken to Yankton, Dak., where he was tried, sentenced and hung. I remained around Deadwood locating claims, going from camp to camp until the spring of 1877, where one morning, I saddled my horse and rode towards Crook City. I had gone about twelve miles from Deadwood, at the mouth of Whitewood creek, when I met the overland mail running from Cheyenne to Deadwood. The horses on a run, about two hundred yards from the station; upon looking closely I saw they were pursued by Indians. The horses ran to the barn as was their custom. As the horses stopped I rode along side of the coach and found the driver John Slaughter, lying face downwards in the boot of the stage, having been shot by the Indians. When the stage got to the station the Indians hid in the bushes. I immediately removed all baggage from the coach except the mail. I then took the driver’s seat and with all haste drove to Deadwood, carrying the six passengers and the dead driver. 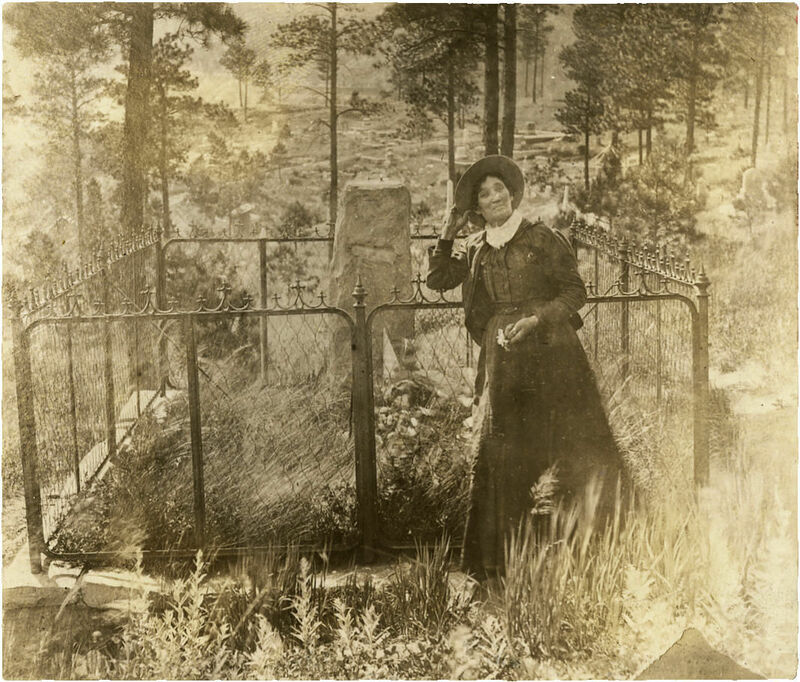 Calamity Jane at “Wild Bill” Hickok’s Gravesite, Deadwood, Dakota Territory. I left Deadwood in the fall of 1877, and went to Bear Butte Creek with the 7th Cavalry. During the fall and winter we built Fort Meade and the town of Sturgis. In 1878, I left the command and went to Rapid City and put in the year prospecting. In 1879, I went to Fort Pierre and drove trains from Rapid City to Fort Pierre for Frank Witc, then drove teams from Fort Pierce to Sturgis for Fred Evans. This teaming was done with oxen as they were better fitted for the work than horses, owing to the rough nature of the country. In 1881, I went to Wyoming and returned in 1882 to Miles City and took up a ranch on the Yellow Stone raising stock and cattle, also kept a way side inn where the weary traveler could be accommodated with food, drink, or trouble if he looked for it. Left the ranch in 1883, went to California going through the States and territories; reached Ogden the latter part of 1883, and San Francisco in 1884. Left San Francisco in the summer of 1884 for Texas, stopping at Fort Yuma, Arizona, the hottest spot in the United States. Stopping at all points of interest until I reached El Paso in the fall. While in El Paso, I met Mr. Clinton Burk, a native of Texas, who I married in August 1885. As I thought I had travelled through life long enough alone and thought it was about time to take a partner for the rest of my days. We remained in Texas leading a quiet home life until 1889. On October 28th, 1887, I became the mother of a girl baby, the very image of its father, at least that is what he said, but who has the temper of its mother.